CAIRO: Militants fired a barrage of rockets and set off a car bomb on Thursday (Jan 29) killing at least 26 people, mostly soldiers, in Egypt’s North Sinai province, where security forces are battling a raging Islamist insurgency. They say this is in retaliation for a bloody government crackdown against Morsi supporters that has left hundreds dead, thousands jailed and dozens sentenced to death after speedy trials the United Nations says is “unprecedented in recent history”. The main focus of Thursday’s attacks was El-Arish, the provincial capital, where a military base, a nearby police headquarters, a residential complex for army and police officers and an army checkpoint were targeted in the biggest such incident since October, the army and security officials said. Security officials said militants first fired rockets at the El-Arish police headquarters and the military base, which was followed by the car bomb. Minutes later a barrage of rockets struck the nearby housing complex. 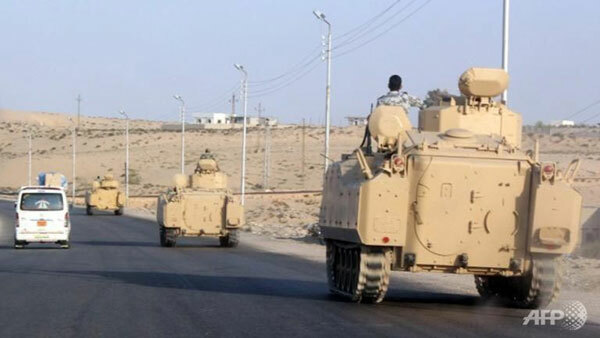 Late on Thursday militants also attacked a military checkpoint south of El-Arish, wounding four soldiers. In a separate attack an officer was killed when a rocket struck an army checkpoint in the town of Rafah, on the border with the Gaza Strip. Overall, officials said at least 62 people were wounded in the attacks in North Sinai. In another incident a police officer was killed when struck by a bomb in the canal city of Suez. The El-Arish attack was the deadliest since an October 24 assault, also near El-Arish, when militants killed 30 soldiers and wounded scores more. It came despite a series of security measures implemented by the authorities in North Sinai since the October attack. That attack prompted the authorities to build a buffer zone along the Gaza border to prevent militants infiltrating from the Palestinian enclave. The buffer was initially planned to be 500 metres wide, but is now being doubled in width. The authorities have also imposed a state of emergency and night-time curfew in parts of North Sinai since the October attack. The military said Thursday’s attack was the result of operations carried out against militants by the security forces, and “the failure of Muslim Brotherhood and its supporting elements to spread chaos on the fourth anniversary of the 25 Jan revolution” which was marked on Sunday. On Jan 25, 2011 millions of Egyptians protested against then leader Hosni Mubarak forcing him to step down. Mubarak was succeeded by Morsi, Egypt’s first freely elected president, but he too was removed from power by Sisi after mass protests against his one-year rule. Since Mubarak’s ouster Egypt has been rocked by political and economic turmoil, leading to a security vacuum in the peninsula. Earlier this week the military said it had killed three militants and arrested one and seized a cache of weapons, including a mortar cannon that the militants had stolen from the army base targeted in October attack. Militants have killed scores of policemen and soldiers, mostly in the peninsula, but the authorities have blamed these attacks on Morsi’s Muslim Brotherhood movement. The Muslim Brotherhood denies the charges. The army has poured troops and armour into the peninsula to fight the insurgency that has rapidly flared since Morsi’s ouster on Jul 3, 2013. In August 2013, just weeks after that event, 25 soldiers were killed in the peninsula when gunmen opened fire at two buses transporting troops.